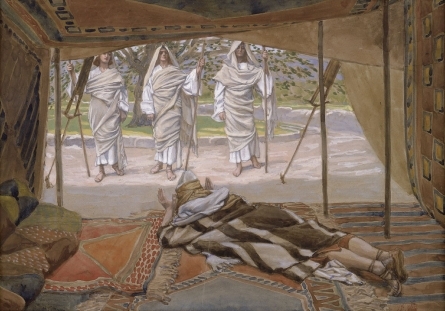 Abraham and the Three Angels (James Tissot)..
Helena Bonham Carter, CBE (born 26 May 1966) is an English actress..With her brothers at college, Bonham Carter was left to help her mother cope..In 2008 August, 4 of her relatives were killed in a safari bus crash in South Africa, and she was given indefinite leave from filming Terminator Salvation, returning later to complete filming..In 2003, Dr. Serena Kogan of Cyberdyne Systems convinces death row inmate Marcus Wright to sign over his body for medical research following his execution..In 2018, John Connor leads an attack on a Skynet base, where he discovers human prisoners & schematics for a new type of Terminator, incorporating living tissue (The T-800)..He is the only survivor of the assault after the base is destroyed in a nuclear explosion..John returns to Resistance headquarters, located aboard a nuclear submarine, and tells General Ashdown of his findings..Working on this intelligence, the human militia plan to launch an offensive against the Skynet base in San Francisco in 4 days; in response to an intercepted "kill list" created by Skynet with a plan to terminate the Resistance's command staff..John Connor learns he is second on this list, following Kyle Reese..They're ready.. Are you?.. Fight Club - Letting Yourself Become Tyler .. In early October 2008, it was reported that Bonham Carter had become a patron of the charity Action Duchenne, the national charity established to support parents and sufferers of Duchenne muscular dystrophy..Typically muscle loss occurs first in the upper legs and pelvis followed by those of the upper arms.. This can result in trouble standing-up..Most are unable to walk by the age of 12..The disorder is X-linked recessive..X-linked inheritance means that the gene causing the trait or the disorder is located on the X chromosome..Since the father retains his X chromosome from his mother, a human female has one X chromosome from her paternal grandmother (father's side), and one X chromosome from her mother..Females have two X chromosomes, while males have one X & one Y chromosome..Red-green colour blindness, a very common trait in humans & frequently used to explain X-linked disorders..Hemophilia B, also known as Christmas Disease, a blood clotting disorder caused by a mutation of the Factor IX gene & leading to a deficiency of Factor IX..Factor IX expression increases with age in humans & mice..Polly, a transgenic cloned Poll Dorset sheep carrying the gene for factor IX, was produced at the Roslin Institute.. It was common among the descendants of Queen Victoria..A tribute was paid on the website of the Bembridge Sailing Club on the Isle of Wight, where both Marcus and his father were prominent members..Among the dead were Eton schoolboy Marcus Egerton-Warburton, 14, the son of leading banker Charlie Egerton-Warburton, who is head of onshore private banking for the UK & Ireland at Credit Suisse..Close to the lifeboat station lies a coastguard lookout.. Positioned at a high elevation, this offers views of the Solent meeting the English Channel to the east of the Isle of Wight.. From this vantage point one is able to view a variety of watercraft year round, although there is more marine traffic in the summer..Bembridge is governed by a Parish council of 12 members..Bembridge is twinned with Plédran, Brittany, France but in name only as the federation has lapsed through non-use..You’re going on a safari tour that’s wilder, furrier and growlier than you ever dared imagine Priest ..Killers like to take trophies & souvenirs from their victims..
Sacrifice of Isaac, by Caravaggio..
His mother, Fiona Bonham Carter, 51, a cousin of the actress, managed to scramble from the wreck with a broken collarbone, while Marcus' older brother Piers escaped with whiplash..The 3 other victims were Fiona's mother Brenda Bonham Carter, 74, her stepfather Francis Kirkwood, 75, and Kay Boardman, the wife of Fiona's brother Graham, 48, who was also in the minibus..The couple married only a year ago, & Mrs Boardman was due to celebrate her 55th birthday on September 1..Her maternal grandfather, Spanish diplomat Eduardo Propper de Callejón, saved thousands of Jews from the Holocaust of World War II, for which he was recognised as Righteous Among the Nations (his own father was a Bohemian Jew).. He later served as Minister-Counselor at the Spanish Embassy in Washington, D.C..Her maternal grandmother, Baroness Hélène Fould-Springer, was from an upper class Jewish family; she was the daughter of Baron Eugène Fould-Springer (a French banker descended from the Ephrussi family and the Fould dynasty) and Marie Cecile von Springer (whose father was Austrian-born industrialist Baron Gustav von Springer, and whose mother was from the de Koenigswarter family).. Hélène Fould-Springer converted to Catholicism after World War II..Hélène's sister was the French philanthropist Liliane de Rothschild (1916–2003), the wife of Baron Élie de Rothschild, of the prominent Rothschild family (who had also married within the von Springer family in the 19th century); Liliane's other sister, Therese Fould-Springer, was the mother of British writer David Pryce-Jones did his National Service in the Coldstream Guards, in which he was commissioned in 1955, promoted Lieutenant in 56, and served in the British Army of the Rhine (BAOR).. In his book, Betrayal: France, the Arabs, and the Jews, he has accused the French government of being anti-Semitic and pro-Arab, and of consistently siding against Israel in the hope of winning the favour of the Islamic world..See also the Holy Trinity Church, Bembridge..
Terminator Salvation - Land Mine HD..
Last edited by lightgiver; 09-12-2016 at 09:36 PM.